Pathogenic wind cold causing occipital headache and temporal headache, dizziness, aching shoulders and neck, stuffy nose and chills and fever. Headaches in general including wind heat headache (from common cold and flu), blood stagnation, including migraines, nervous headache and frontal headache due to food poisoning, indigestion or sinus infection are some of the imbalances satisfied clients have used this product for. 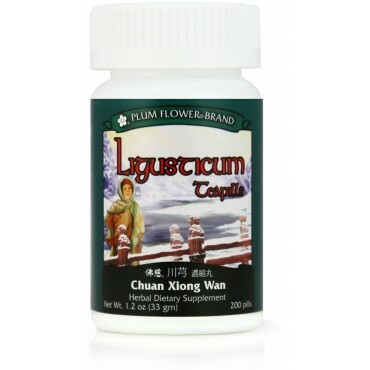 Mentha haplocalyx herb, Ligusticum chuanxiong rhizome, Schizonepeta tenuifolia herb, Notopterygium incisium root & rhizome, Angelica dahurica root, Glycyrrhiza uralensis root, Saposhnikovia divaricata root, Cinnamomum cassia twig, Activated carbon, Botanical wax, Talcum. - Bo he, Chuan xiong, Jing jie, Qiang huo, Bai zhi, Gan cao, Fang feng, Gui zhi, Activated carbon, Botanical wax, Talcum. Contraindicated during pregnancy. Not suitable for headaches due to deficiency patterns.